Crisp twice-baked Italian cookies are flecked with chopped chocolate sandwich cookies for a twist on a dessert classic. Serve with coffee for dunking. Mix sugar, butter, eggs and vanilla in large bowl until well blended. Add flour, baking powder and salt; mix well. Stir in chopped cookies. Divide dough in half. Use floured hands to shape each half into 9x3-inch loaf on baking sheet sprayed with cooking spray. Bake 25 to 30 min. or until golden brown and toothpick inserted in centers comes out clean. Cool 10 min. Cut each loaf diagonally into 16 (1/2-inch-thick) slices. Place slices, cut sides up, on same baking sheet. Bake 10 to 12 min. on each side or until lightly toasted on both sides. Remove to wire racks; cool completely. Drizzle cooled biscotti with melted chocolate. Looking for something sweet? 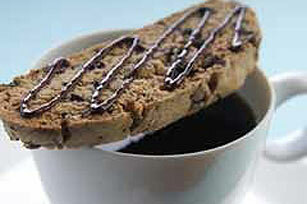 Enjoy a biscotti with a hot cup of freshly brewed MAXWELL HOUSE Coffee. For an especially festive look, substitute 1 oz. melted BAKER'S Premium White Baking Chocolate for 1 oz. BAKER'S Semi-Sweet Baking Chocolate; drizzle the 2 different chocolates over the cooled biscotti.